I’m just a 30-something teacher trying to find my path in the world. I grew up in western Washington, in the USA. After getting my teaching degree, my first full-time job was teaching English and History in Madrid, Spain. It was an incredible experience. I loved learning about the culture, food, and daily life in Spain. And of course I loved traveling around Europe on my breaks! After 2 years in Spain, I moved back to Washington, but I continue to travel. I caught a bug that I’ll never get rid of! When I decided to move to Madrid, I started this blog to chronicle the adventure. I wrote about daily experiences in Madrid and my experiences while learning about the new culture. I wrote entries about places I’ve traveled to while living there. Now that I’m no longer in Madrid, I update this blog less regularly as I only do 2-3 big trips per year, but I hope you continue to read! 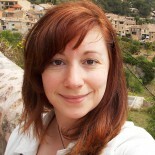 Hi Erin – I will go to study in Barcelona this September, so I am glad I found your blog. Will have to return to explore your stories of Spain 🙂 How is your Spanish doing? Do you teach in english or spanish there?